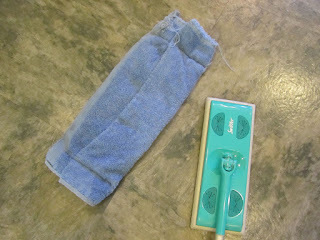 I've seen those pinterest pages with very nicely done Swiffer-style mop heads, that can be washed and reused. They're neatly sewn and look so professional. For a while, I felt like my sad-looking mop head was put to shame. (Yes, I do sometimes catch a case pinterest-envy.) Then I realized, there are some things that don't need to look pretty to be functional. And to me, mop heads falls into that category. So, stand tall, old rag become mop head. You're doing a fine job! This is my reusable mop head. I fell into the same trap as many, and about 15 years ago bought a Swiffer because, "it would save me so much time". For many years, I used rubber bands to hold rags onto the Swiffer. That did work. This past January, though, I got serious about mop heads (said, tongue in cheek). I grabbed one of my old pre-married life towels, and turned it into a mop head that didn't require rubber bands. I took a hand towel, folded it over, then folded this into almost thirds, measuring against the Swiffer head. Then with my sewing machine, I straight-stitched the ends, to hold everything in place. I did this all rather hurriedly, and spent at most, 5 minutes. I didn't even bother with trimming the ends. I used an ordinary sewing needle, and my machine is nothing fancy, but was still able to sew through all the layers of towels. To use it, we slide the Swiffer into the opening, and just line up the edges so the Swiffer is centered in the folded and stitched towel. I didn't blog about this, as I wanted to give this mop head a chance to prove itself. Six months of weekly mopping, and it's still holding up fine. The stitching hasn't broken. The mop heap still slips onto the Swiffer, and stays on. When my husband mops, he'll hold the whole thing under the kitchen faucet. When I mop, I spray the floor with a bottle of vinegar and water, then mop. And after each mopping, we put the mop head through the washer and dryer to clean it. Part of me was expecting to have to mend this by now, or have trouble keeping the mop head on the Swiffer. But so far, no troubles. And even if she isn't the prettiest of mop heads, she's doing a fine job. The beauty of making this mop head with an old towel is that I have no shortage of old towels. When this one falls apart, I'll be able to make another. And so we all have our ways and I'm no exception. We have something like a Rubbermaid Trapper Wedge Dust Mop Head but the old vintage kind that is on a long handle. I actually have two of them but I don't love taking them off the bracket so I use and old cloth and binder clips to clip them around the mop head. I sprinkle water on the cloth and mop away. Unclip and throw it cloth in the wash until next time. I also use the dry mophead to reach into ceiling corner to grab cobwebs or even wipe my screens down in the summer when they capture the "cotton" blowing around. Or pollen that sticks to the screens. The down side is that getting it off the bracket is not easy and it sometimes looks clumpy like the "dreadlocks" are all bunched up together. I rarely wash it and getting the exact replacement might be difficult since it is vintage. I'm all with you Lili, to save money where it can easily be saved. That sounds like it works well for you! I love using rags on a mop, as they can be washed so easily. It sounds like you have a very similar set-up. I love this idea! I don't have a machine but i do have many industrial strength rubber bands my husband got from a job he did. 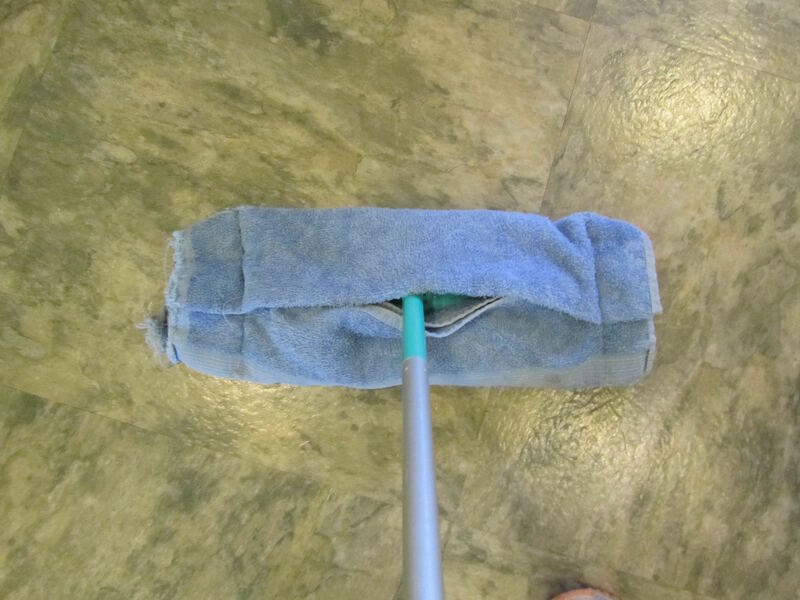 (When i dust the wood floors, i use two used dryer sheets on the swifter; it works like a charm!) I'm definitely borrowing this! Thanks! The rubber bands really did work well-enough for me, for many years. That's a good tip about using dryer sheets for dust-mopping wood floors. I'll give that a try. Thanks! Have a wonderful day, momsav! Good idea....But for us, we have ceramic tiles, so to get in the grout I use two rags and get down on my hands and knees. No, just kidding. I use my other appendage, my feet lol. Like you, I use a spray bottle with a no rinse floor cleaner from Sam's Club and with a rag under each feet, I skate over the tiles, giving extra pressure on grout areas with my toes. What a funny sight I know but the floor gets much cleaner, not slippery or dangerous as long as I do it slowly. I did the mop thing before but it didn't have enough pressure in the grout areas, I think my premodern method works better. It really is almost fun like a kid playing around. I've always thought someone should market "slippers" made to be floor dusters/mops. You spray them down, put them on your feet, then just go about your usual work in the kitchen for the morning, and before you know it, your floors are clean! We just have ceramic tile, with depressed grout lines, in the entry hall, and I don't think I've mopped that in years. Eeek! It gets swept weekly, and that's about it. But then, it's not a kitchen where liquids get spilled and dripped. So maybe I'm not such a horrible housekeeper! Your method sounds like it's working well for you. Ain't broke, so don't fix it! Like YHF, I usually mop my kitchen floor with an old hand towel under my foot. I have a Swiffer which I have also put a rag on in place of the ready made sheets. I think I will sew one of the towel ones and give that a try. I will try the dryer sheet for wood floors idea too. It sounds like you've found a couple of good ways to get the kitchen mopped. 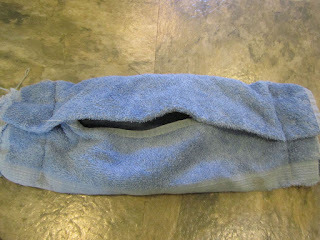 I love using rags to clean the floor, as they can be laundered. Those old string mops would get so stinky from mildew, as they couldn't be easily laundered/dried. Have a wonderful day, Mary! Great idea! I like practical. Very practical, indeed! 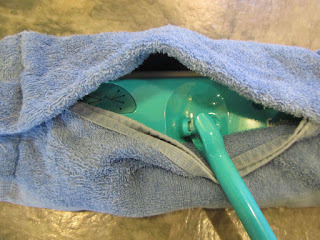 I look for practical tips, myself -- anything to make housework simpler, without extra expense. I think that a very similar solution to yours might work GREAT for fixing this mop, and be much more practical than either new elastic or safety pins. Love the clever wrap. Nice work! Yeah, putting in more elastic around the edges does sound like as much work or more than sewing a different way to hold the mop head on. You may be able to attach elastic "straps" to the existing mop head (instead of elastic all around the edge), that you'll just stretch to pull the mop head part onto the frame. I'm all for simple. It does sound like the microfiber is good for floor-dusting. In the meantime, it sounds like you've found a sort of workable solution, just keeping pressure on it while mopping. Have a lovely day, Sara! Our son and I were looking at the slip-on construction of our big dust mop, and it's similar to yours. But your configuration, I think will work better for the little one, when I get a chance. As you said, at least I can still use it for now, as long as I press hard. Good for my biceps! Mopping isn't a pretty job, so why should mop heads be pretty? Great idea. I just inherited a sewing machine. After I figure it out, this would be a good and simple project for me. I love Swiffer mops, but I do get on my hands and knees a couple of times a year--I get my cabinets and baseboards really well then, too--sometimes it's the best way to clean all that cat hair!